Lava Lanes is a fantastic place to have fun with family and friends of all ages, and with bowling, food, and a huge sports bar! We have 40 bowling lanes with automatic scoring, food and treats, arcade, bar, bowling lockers, tournaments, meeting space, and off track betting, all in a smoke-free environment. We offer bumper bowling and ramps for even the smallest of bowlers. Lava Lanes is also the perfect place for your next corporate event or birthday bash, no matter what your age! 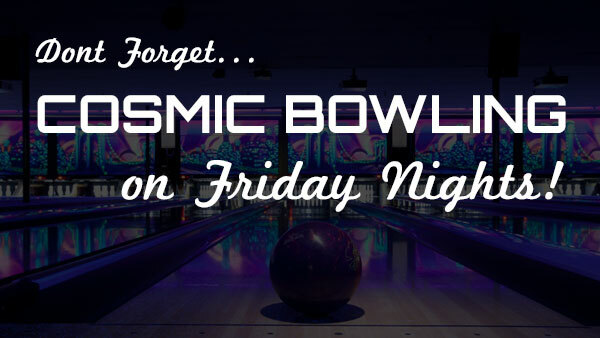 On Friday nights we have Cosmic Bowling with great music by local DJ’s turned up and awesome special effects lighting. When looking for fun in Medford look no further than Lava Lanes! Our Huge 6,000 Sq Ft. Sports Bar features 72 TVs, with 18 Plasmas and an awesome 60” Plasma Cube. With all these TVs it is the best place in town to catch your game. Your assured a great seat no matter where you sit! Enjoy local or domestic brews with 20 options on tap and a full bar while you root on your favorite team or play pool with friends and family. The Sports Bar at Lava Lanes is the premier sporting event Center in all of southern Oregon! We also now feature Buzz Time Trivia. Click here for more info.